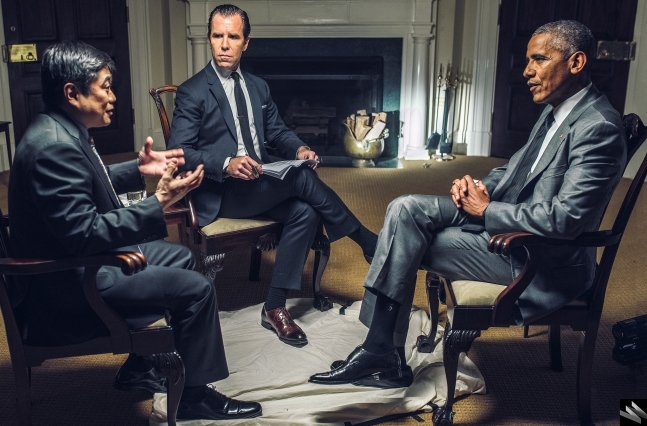 When President Barack Obama agreed to guest-edit the November issue of WIRED, he selected MIT Media Lab Director Joi Ito for an exchange of ideas about artificial intelligence (AI). Their recent interview at the White House is featured in the latest online issue of WIRED, published on Oct. 12. The one-on-one conversation, moderated by WIRED Editor-in-Chief Scott Dadich, ran the gamut of topics at the intersection of societal needs, ethics, and technology — from cybersecurity to self-driving cars; from the roles of government, industry, and academia to the lack of diversity in tech; from “moonshot” motivations to innovation at the margins; and from neurodiversity to Star Trek. All this was covered in the context of AI and extended intelligence (EI), which uses machine learning to augment human capabilities. Ito says his overarching message for Obama in their conversation was that AI — and the space it occupies — is no longer just a computer science issue. “It’s also very much a societal thing.” And we shouldn’t underestimate the difficulties, he adds. “We can’t think that machines will just figure it all out for us. Everyone needs to recognize the importance of understanding how AI behaves, and we have to address the critical need to build societal values into AI.” Ito is encouraged by what he characterizes as the president’s “amazing team,” which includes U.S. Chief Technology Officer Megan Smith ’86, SM ’88, along with Deputy U.S. CTOs Alexander Macgillivray, formerly a lawyer for Twitter, and Ed Felten of Princeton University. Above all, says Ito, “What’s important is to find the people who want to use AI for good — communities and leaders — and figure out how to help them use it.” To that end, Ito says, the MIT Media Lab is committed to not only exploring the technology of AI and EI but also addressing their ramifications for humankind.